Hereâ€™s yet another great way to combine the perfect low carb keto ingredients! 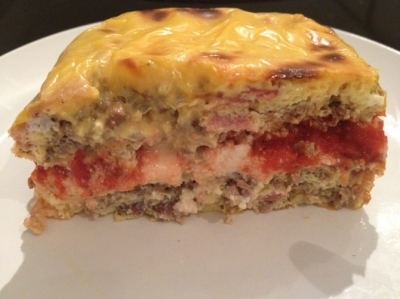 This recipe uses eggs, bacon and ground buffalo in place of noodles for a low carb lasagna! I have officially become a ground buffalo addict! I donâ€™t think Iâ€™ll ever go back to ground beef! Buffalo/ bison is rich in CLA (good fat), stabilizes blood pressure, enhances metabolism and reduces body fat while preserving muscle! The only change I would make in this dish is maybe adding an extra layer of either shredded or american cheese in the middle layer on top of the ricotta and marinara sauce!